Playmakers. You can't talk about them. You can't dream about them. When it comes to a Sunday afternoon in the NFL, you'd better have them. For many weeks this season, the Bucs have been short in that department. One game it was receiver Joey Galloway, then it was running back Michael Pittman, then receiver Joe Jurevicius, then fullback/running back Mike Alstott. On and on and on. Since training camp, Jon Gruden has patiently awaited a game when his play-calling wouldn't be limited by the absence of a player or two. The waiting seems to be ending. In Sunday's 35-3 pasting of the 49ers, the Bucs got contributions throughout the offense. The line blocked well, the running backs churned up yards, the quarterback was (mostly) accurate and the receivers seemed to spend all their time being dragged down from behind. "We're coming together," said Pittman, who finished with 106 yards on 21 carries with two touchdowns, his third 100-yard game in four weeks. "We have a lot of new faces on this team and a lot of new guys, and we're finally coming together as a unit, and a lot of people are seeing that right now. Last week, we really didn't show our talent. We were struggling, but this week we came out and put on a pretty good show. We think we're better than we showed (in a 24-14 loss to Atlanta), and we're just going to keep pressing to get better every week." Maybe there were some mistakes against the 1-9 49ers, but the truth is the Bucs offense put up 352 yards and scored four touchdowns. 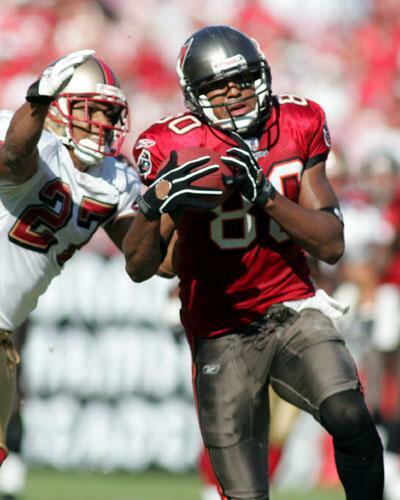 Looking much like the threat he was during the 2002 season, Jurevicius had five catches for 82 yards. The biggest blow came with 17 seconds left in the first half, when he outran the 49ers secondary to catch a 42-yard scoring pass from Brian Griese. "I never doubted that I would get back in there," said Jurevicius, who has played nine games the past two seasons. "I have always looked to be a spark on this team. The most important thing is to give credit to the guys that are around me." Start with Galloway. Traded by Dallas to Tampa Bay for Keyshawn Johnson, Galloway sustained a severe groin sprain in the opener and missed the next six games. Since returning Nov.7 against the Chiefs, he had three catches for 44 yards. Sunday, he had three for 33 yards. "It's a lot more fun, I can tell you that," Galloway said. "A lot more fun to play like that, when you know if you're not open, Joe will be open or Mike (Clayton) will be open or we can run the ball with Pittman. It's fun football." Particularly exciting to the team is that Galloway seems to be making strides in his rehab. "The goal is to feel a little better each week, and (Sunday) was a positive step," Galloway said. "I'm sore now, but hopefully I'll feel better by Thursday and get ready to go for a big game in Carolina." No Bucs outburst has been complete without the services of receiver Clayton, who had four catches for 66 yards and continues to make his first season seem like his fifth. "Having the weapons makes the defense respect you more, and it opens up everything," Clayton said. "It's easier for the quarterback. He's more poised back there and everybody is happier when everybody is getting the ball. It makes you want to go out there and compete more. It's a relaxing feeling." 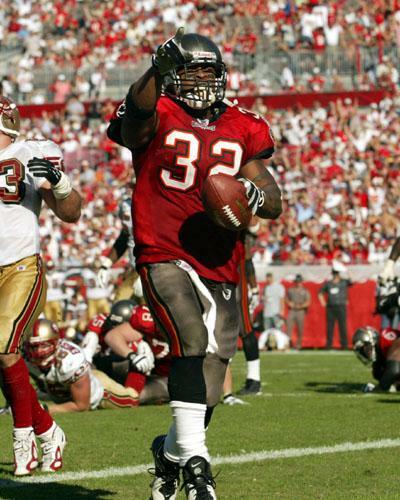 Even Alstott, who sustained a severe knee injury against the Bears on Oct.24, returned ahead of schedule and chipped in seven carries for 21 yards. "It was great to be back in there, especially for the team and how we won," he said. "It's huge. (We have) explosive weapons. When you have deep threats downfield with Joey and (Jurevicius), and Michael is doing great so you have to cover him and Pitt is running great, we're starting to see everything coming together." All this bodes well for Griese, who was 15-of-21 for 210 yards and two touchdowns and who said the Bucs can make a run at the playoffs. "I feel really good with the guys we have," he said. "We've been through a lot and a lot of guys take the criticism, and I think we have kind of pushed through it and will continue to push through it."